It's already well known that a diet may have a life-extending effect. Researchers from Leibniz Institute on Aging – Fritz Lipmann Institute (FLI) in Jena, Germany, now showed that besides improving the functionality of stem cells in mice, a caloric restriction also leads to a fatale weakening of their immune system – counteracting the life-lengthening effect of a diet. The results are published in the Journal of Experimental Medicine on March, 14. 2016. Only few years ago, researchers succeeded in prolonging the lifespan of worm C. elegans, fruit fly D. melongaster and rats by almost 50% through a simple caloric restriction – which immediately fueled hopes for having found one key to a longer life also for humans. However, transferring these results to long-lived primates short after was not equally successful and cooled down enthusiasms quite quickly. Now, aging researcher Karl Lenhard Rudolph, Scientific Director at the Leibniz Institute on Aging – Fritz Lipmann Institute (FLI) in Jena, Germany, and his team showed that caloric restriction even has a severe downside. In feeding experiments, the stem cells of mice, which were set on a diet, were found to age slower – but the murine immune system was almost completely cut down. Outside of optimal, sterile laboratory conditions, this could lead to severe live-shortening infections. The results of the study are published in the Journal of Experimental Medicine's current issue. The study focused on the effects of caloric restriction on blood stem cells (so-called hematopoietic stem cells, HSC) that are responsible for building red blood cells or lymphocytes (immune cells). Like for any other adult stem cell, HSC functionality decreases with every single cell division – the stem cells age. This is why they stay in a resting phase (quiescence) most of the time and are only activated when a massive cell reproduction is required (e.g. after acute blood loss). In their study, the researchers from Jena investigated how a 30% food restriction effects stem cell aging in mice. One main result was that the HSC stayed in a quiescent state even if simulated stress would have required their activation. This effect was found regardless of how long the diet lasted. Thus, during diet, the blood stem cells did not age at all and their functionality to build new blood cells remained increased even one year after diet. But the long-term diet had a downside, as well: The mice's immune system almost completely was cut down. Although the diet had no strong effect on the overall cell number of blood cells, the production of lymphocytes – needed for immune defense – was decreased by up to 75%. 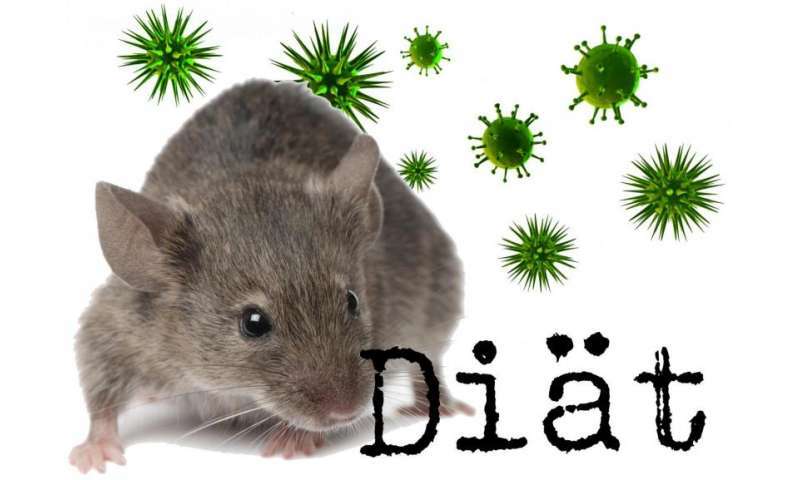 As a consequence, mice were particularly prone to bacterial infections. "The study provides the first experimental evidence that long-term caloric restriction – as intervention to slow down aging – increases stem cell functionality, but results in immune defects in the context of prolonged bacterial infection, too. Thus, positive effects of a diet are not transferable to humans one to one", Rudolph sums up the study results. Even if – under laboratory conditions – aging of single cells or tissues may be slowed down through a diet, the immune suppression may have fatal consequences in real life. To benefit from caloric restriction or medicinal mimetika aiming at increasing health in the elderly, possible risks of such interventions to come down with life-threatening infections remain to be elucidated. "In sepsis patients, we see a higher survival rate for those with a higher body weight than for patients who are very lean", Prof. Dr. Michael Bauer, Director of the Center for Sepsis Control and Care at University Hospital Jena (UKJ), concurs. stopping aging in stem cells FAR and AWAY TRUMPS rare increased risks during a rare sepsis condition. thanks for the info confirming anti-aging properties of caloric restriction! One wonders if stem cells removed early in a mouse model's lifetime could have been preserved and later cultured in large quantities for transfusion in the same mouse's "old age". Bacterial insults to the old mouse can then be compared to identical mice w/o the "young" stem cell transfusion. Presumably one could also run this test with the caloric restricted mice. If the young stem cells protect as well in starved older mice as compared to younger mice and better than the well fed older mice, the findings might be used therapeutically with engineered stem cells in older people. In a fasted state, the body may simply not need as many lymphocytes, because the potential sources of disease and sickness have less of a chance to begin with. That doesn't necessarily mean the immune system is weakened. It could be that if it were necessary, those calorie-restricted mice would be able to produce more lympocytes, but maybe they are choosing not to simply because they don't need to. The mice "mice were particularly prone to bacterial infections," but were they able to recover quickly? Quick recovery from those infections would imply the immune system was not impaired. This study should be followed up by one in which the immune systems of the calorie-restricted mice are tested in more threatening scenarios to see how well they are able to fight off disease and infection compared with non calorie restricted mice. The calorie restriction itself might make it harder for a bacterial infection or other disease to get out of hand, which may be why the immune system of the calorie restricted mice tends to be less active.